Muriel Dance currently serves as Executive Director of the Sandra Caplan Community Bet Din. She graduated as a Jewish Chaplain from the Academy for Jewish Religion, California in May 2011. After completing her four units of Clinical Pastoral Education, she accepted employment as a Spiritual Counselor at Skirball Hospice, and then applied for and received Board Certification as a Chaplain through the Association for Professional Chaplains. After retiring from Skirball Hospice in February, 2016, she focused on providing leadership for the AJRCA Clergy and Alumni Association. 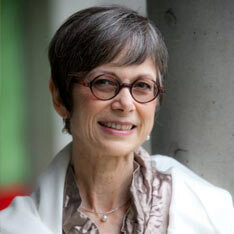 Muriel earned her Ph.D. in English from UC Berkeley, attended the Harvard University Management of Lifelong Education Institute and spent a sabbatical year in Israel as a Senior Educator at Hebrew University’s Melton Centre in Jerusalem. Before moving to Los Angeles to begin her Jewish Studies, she directed continuing education at Antioch University Seattle and other institutions of higher education. She also chaired the adult education committee at Congregation Beth Shalom, Seattle, where she taught Hebrew and Introduction to Judaism for several years and served on the Board of Trustees at Hillel University of Washington. She is married, the mother of two adult children, and a member of Ikar synagogue in Los Angeles. The Jewish traditions provide a way for human beings to experience grief more fully, a time to reflect on the spiritual question of who am I now that my parent has died, and then move beyond grief and loss towards wholeness. Rabbi Angel has pointed out that when a parent dies, adults are likely to be thrown into an existential situation in which they reflect on the meaning of their own lives and human life in general. Do Jews-by-choice draw on their Judaism to address this spiritual question? Do they use Jewish mourning rituals to address in practical ways solutions to the existential dilemma? On an individual level, Jews-by-choice may feel like they hang on a tightrope between the cliffs of honoring parents and of honoring the tradition and values they have embraced. This thesis explores answers to question of to what degree do Jews-by-choice observe Jewish mourning customs and rituals for their non-Jewish parents both on an individual level—what does the individual need—and on a collective level—what does the tradition require and what is required of the community in response to the mourner. Does the Jew-by-choice or the intermarried person feel a sufficient part of the Jewish collective that he/she participate in the collective part of the healing process?